Asparagus acutifolius commonly known as wild asparagus is an evergreen perennial plant belonging to the genus Asparagus and Liliaceae (Lily family). 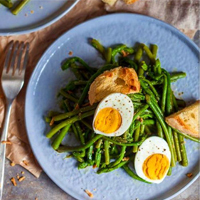 Although it is occasionally referred to as Chinese asparagus, wild asparagus originated in the Mediterranean. 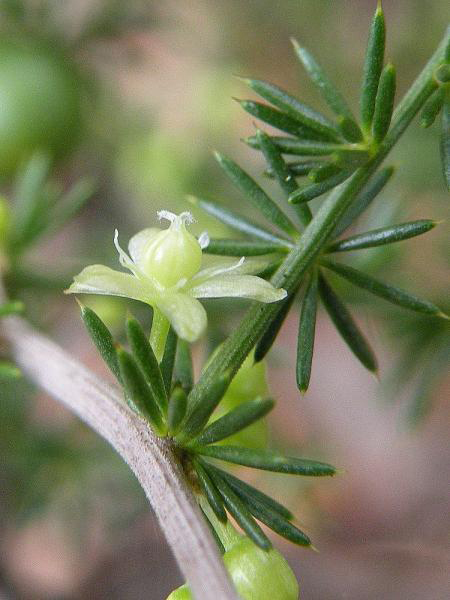 It is now a popular herb in both Chinese and Korean medicine, and grows in the mountainous regions of both countries. The root is used medicinally. 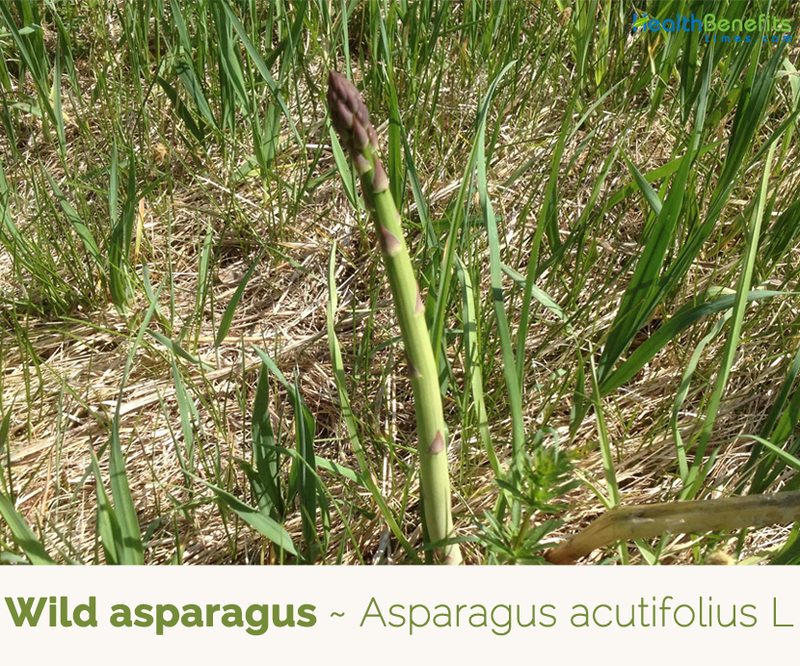 Very few common names of the plant are lesser asparagus, Wild asparagus and Chinese asparagus. Wild Asparagus is actually an uncultivated asparagus that grows on its own in the wild. The specific epithet, acutifolius, meaning “thorny leaves”, is derived from Latin acutus (pointed, acute), and -folius (-leaved), and refers to the characteristic shape of the leaves, a quite common feature in the typical plants of the Mediterranean. 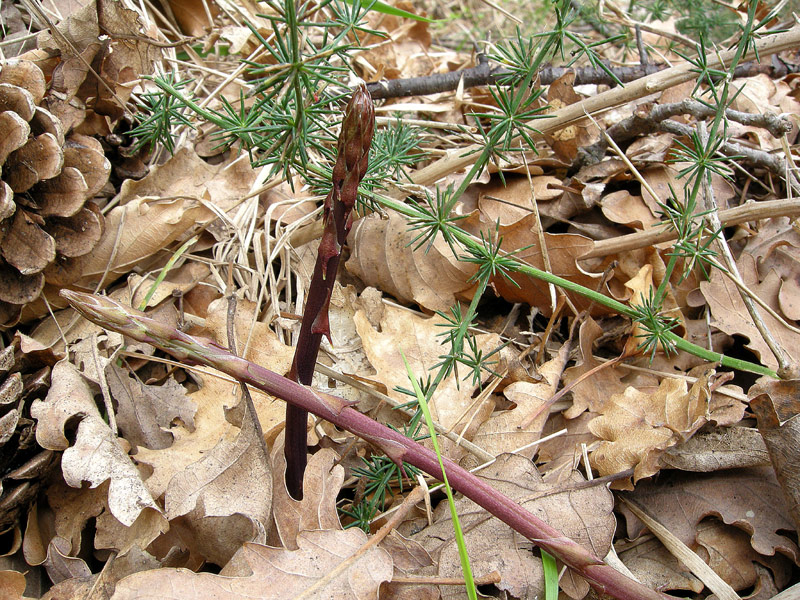 Wild asparagus is very important edible plant in Mediterranean area. Main part of the plant which is used for food is shoots. It has been collected from the ancient time. It is considered an interesting crop for marginal rural areas due to its frugality, which allows it to be cultivated in arid soils, and for its already existing market. 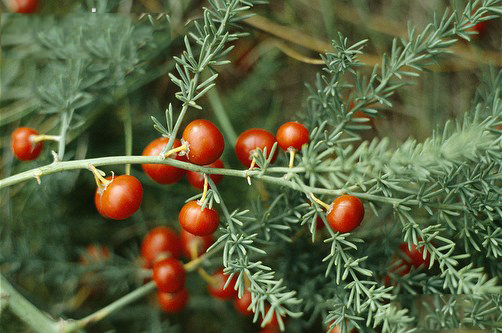 It is considered a healthy food used in folk medicine as diuretic to treat several kidney related disorders. It is consumed cooked in different dishes, although it is preferred with eggs, i.e. omelets, scrambled or poached eggs. 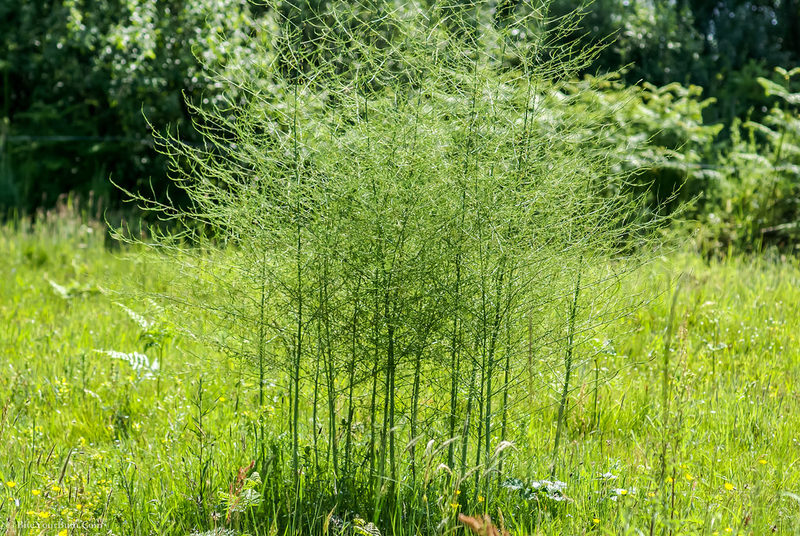 Wild asparagus is a creeping, evergreen, dioecious, perennial plant that grows about 1 meter tall. The plant is found growing in black soil prairies, grassy meadows, thickets, fence rows, power line clearances in wooded areas, abandoned fields, vacant lots, gravelly areas along railroads, grassy roadsides, waste areas, thickets of deciduous and coniferous trees, uncultivated land, olive groves, territories hit by fires, near woods and in uncultivated places. Typical, sandy, or gravelly habitats with a history of disturbance are preferred. The plant grows readily in soil that contains loam, sand, or gravelly material. 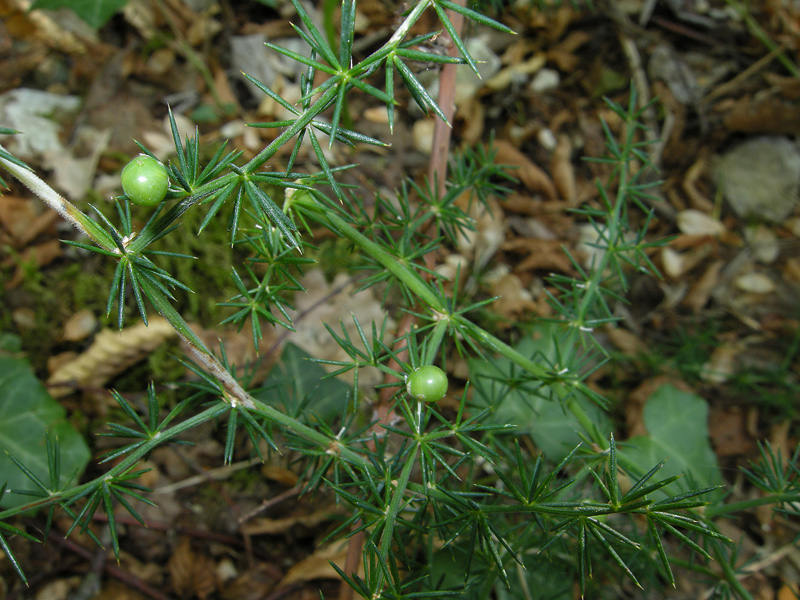 Stems are spiny, light gray; with many short, parallel growing branches. There are female and male asparagus which are different in taste and length. 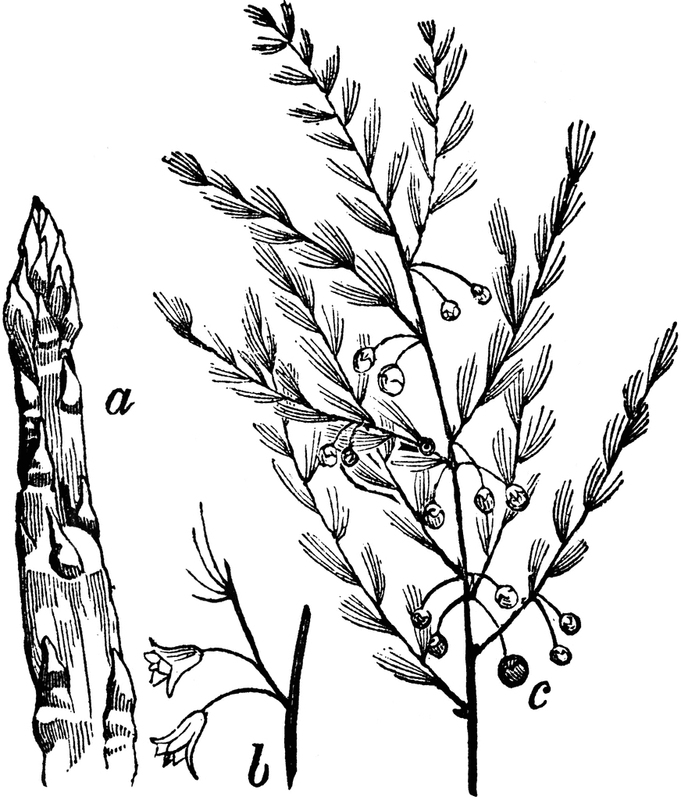 Female asparagus is longer, thinner, branched but much bitter than male one therefore not popular. 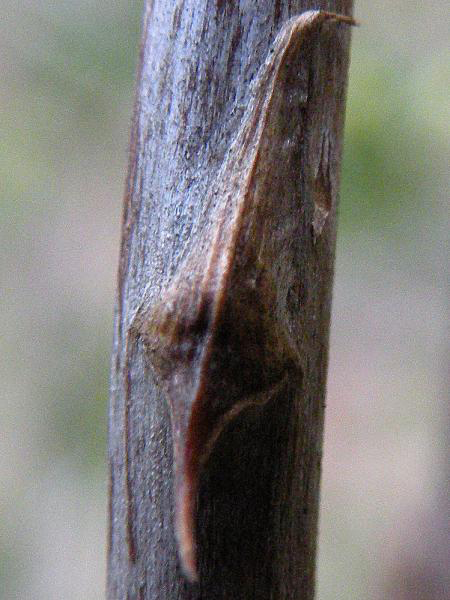 Leaves are the scales present in the main stem and clearly visible in the shoots; the cladodes (or cladofilli) are instead real branches, modified so as to be able to carry out photosynthesis, which otherwise is not carried out by the leaves. These modified branches are made up of small; needle-like structures with a sharp point, gathered in bunches. Flowers are bell-shaped and in small clusters, greenish-white to yellowish, 4.5–5.5 millimeters (0.18–0.22 in) long. 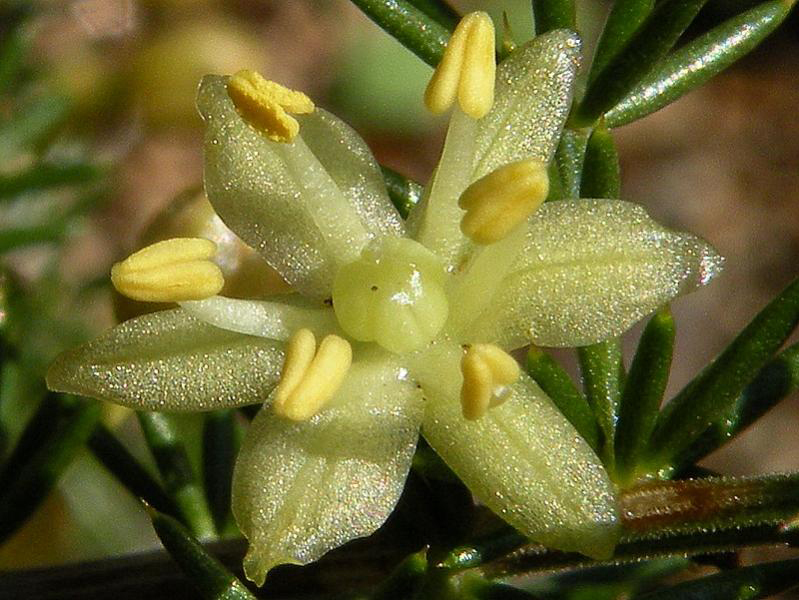 The flowers are dioecious (on each plant they are only male or female). Flowering normally takes place from August to September. from the female ones the fruits will form. 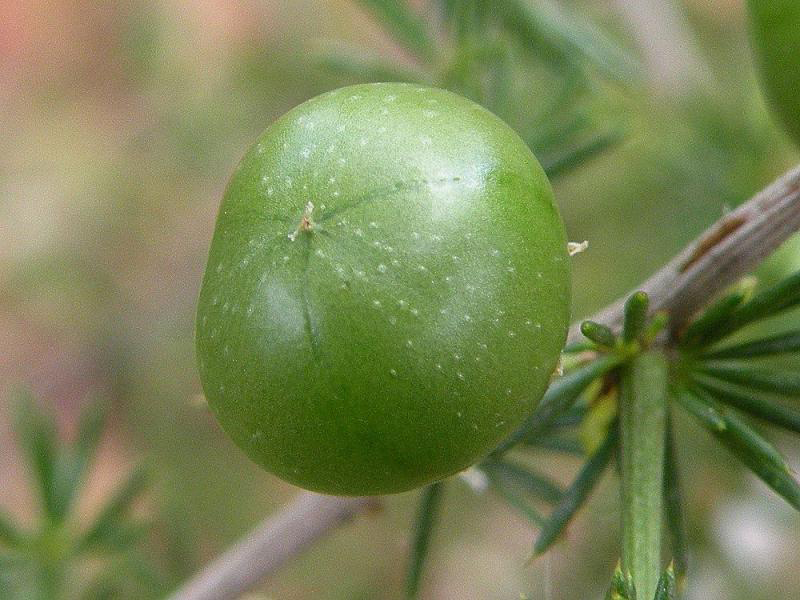 Fertilized female flowers are followed by small green round berries, of 5–6 millimeters (0.20–0.24 in) in diameter, which become neratre when ripe, and is toxic. Fruits are initially green to yellowish green, but they become red at maturity. 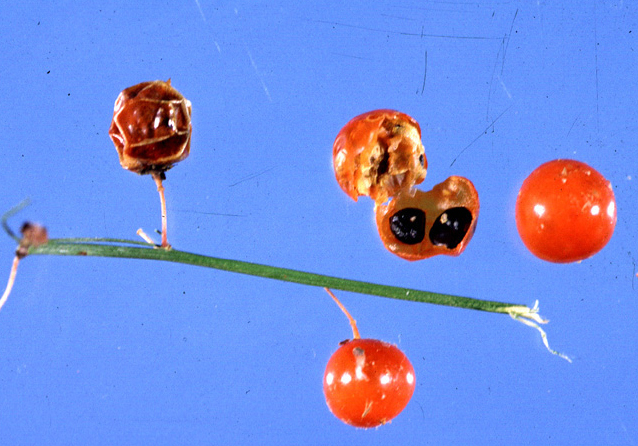 Each fruit consists of 1 or 2 seeds. 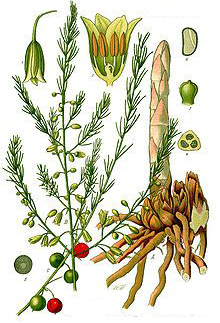 Taoists claim that by consuming wild Asparagus Root a person can gain the ability to fly. This flying represents the ability to rise above things that are mundane and is the freedom of Spirit that can be experienced when one has achieved harmony. Among its ability to help with the lungs and skin it can cultivate an increased sense of compassion, opening the heart center and relaxing an overactive mind. Many people who take this herb for extended amounts of time say that it has increased their levels of joy and happiness. The Chinese say that “wisdom comes from the lungs.” and that’s why we can see this herb play such an important role in our lung health both on a spiritual level and of course a physical. It is a powerful but gentle tonic for the lungs and it helps to moisten dry lungs. It would be great for smokers, exposure to toxins, dry environments and for people with dry coughs. Its helps to moisten the lungs, break away tar, removing toxins from the respiratory tract, and improves all respiratory functions. This herb assists your body’s natural ability to produce mucous, breath deeper and is currently being studied for the treatment of lung cancer. It’s a great way to keep your lungs healthy and clean! We all know how important it is to get sleep. Since this herb relaxes the mind and helps reduce stress it can be used as a wonderful sleepy time herbal remedy. The herb is also known as a dream inducing herb or Oneirogen. Many people including Taoists report having lucid dreams in which they are flying or soaring through the sky. It’s quite a freeing experience that most anyone (with practice) can have! Beautiful skin is a sure sign of pure blood and healthy lungs. 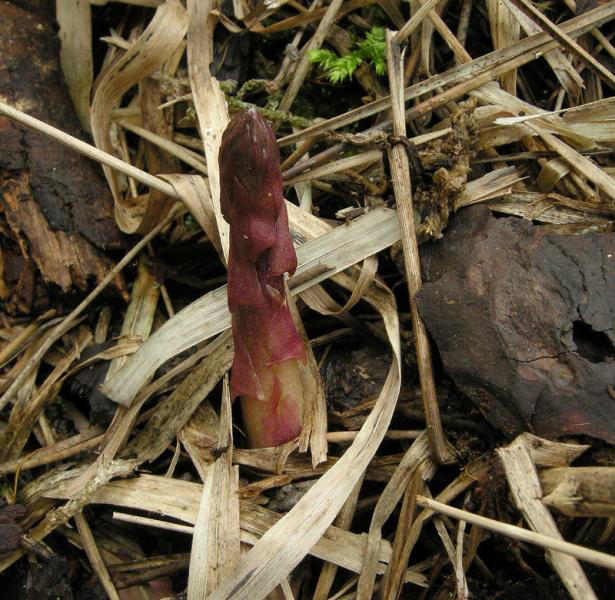 Many Tibetan Buddhist monks admire this herb and say due to wild asparagus their skin is so soft and they look so young. Root consists of vitamins, minerals and phyto nutrients that naturally promote soft, smooth, supple healthy skin from the inside out! This herb has also been traditionally used as a powerful sexual tonic for both men and women, similar to the ayurvedic herb Shatavari (Asparagus racemosus). Its ability to open the heart, relax the mind and increase bodily fluid plays a key factor as an aphrodisiac and sexual tonic. Nutrients contained in the root are known to help infertility, genital dryness and address sexual inhibitions. It is especially used by woman to aid female disorders from PMS to menopause to sexual dysfunction. Edible shoots have well-known diuretic properties, as well as aperitifs, anti-edema, anti-rheumatic, purifying and laxative; from the dried roots it is possible to obtain a mother tincture with purifying, slimming and anti-inflammatory properties. In the field of Tuscan folk medicine, shoots are used to prepare a decoction, which orally assumes a diuretic and anti-inflammatory action. 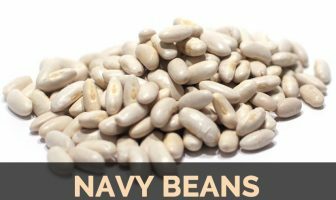 It is commonly considered a healthy food with diuretic and purifying effects. Its consumption is recommended in folk medicine as a digestive, to treat several kidney and liver-related disorders, prostate illnesses, bile duct lithiasis or bile inflammation, and to lose weight. Young shoots can be consumed after cooking. 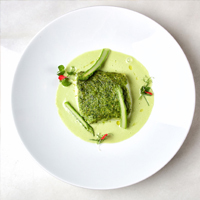 An asparagus substitute, it is preferred by gourmets for its stronger flavor. Excellent when seasoned with oil and lemon juice. The plant has a uniquely bitter aromatic flavor. They are cooked and seasoned with oil and lemon, in soups, pasta and risottos. 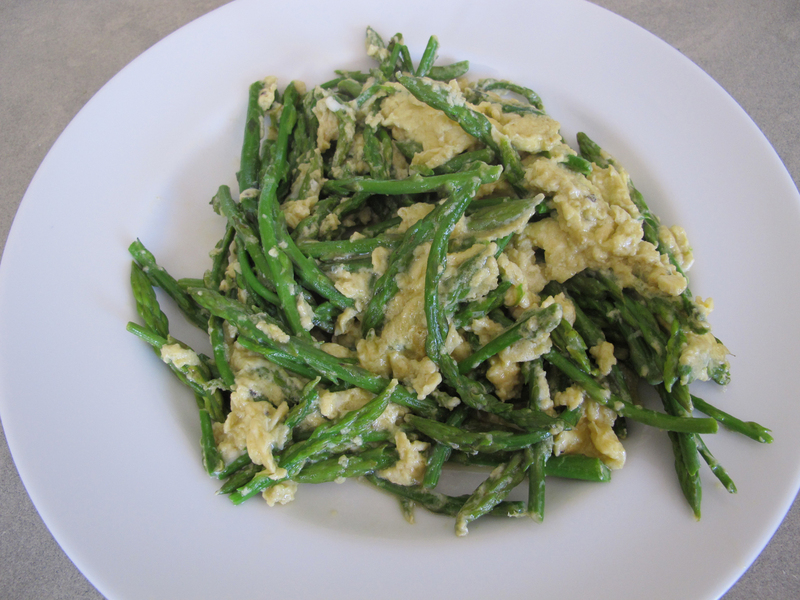 Most used recipe in the Mediterranean area is the wild asparagus frittata. They are eaten raw in salads, in Tuscany and Sardinia they are preserved in oil In Romagna. 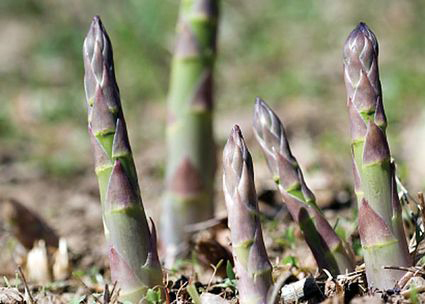 Young sprouts can be consumed in the spring like Asparagus officinalis sprouts. They are generally consumed cooked in different dishes, such as rice dishes, soups, and more frequently with eggs, that is, omelets, scrambled, or poached eggs. They are also fried in the pan with oil and onion, to add aroma to the tomato sauce, as seasoning for risottos, or to fill ravioli in Italy. They are also used in some traditional recipes, such as the migas de espargos in Portugal or the sagne larghe in the Italian region of Abruzzos. Some practitioners use asparagus as part of a facial mask to moisturize the skin and nourish yin. It is used for the elimination of fluids and toxins, helping to fight cellulite, to purify and brighten the skin. Decoction of the plant has also been used to aid the placental expulsion in animals, such as sheep and cows. Ethno botanical studies refer that this plant usually grows in olive-tree groves. In rare cases, however, it may cause allergic skin reactions. In the case of suffering such as gout, gravel, rheumatism, diabetes and kidney stones, the consumption is disregarded. Give wild asparagus a thorough wash.
Bring a pot of water to a boil. Add a pinch of salt. Add the asparagus and whole eggs to cook. Cook on medium for about 10-15 minutes, until the asparagus are cooked through. Drain and set aside to cool. Peel eggs and slice them. 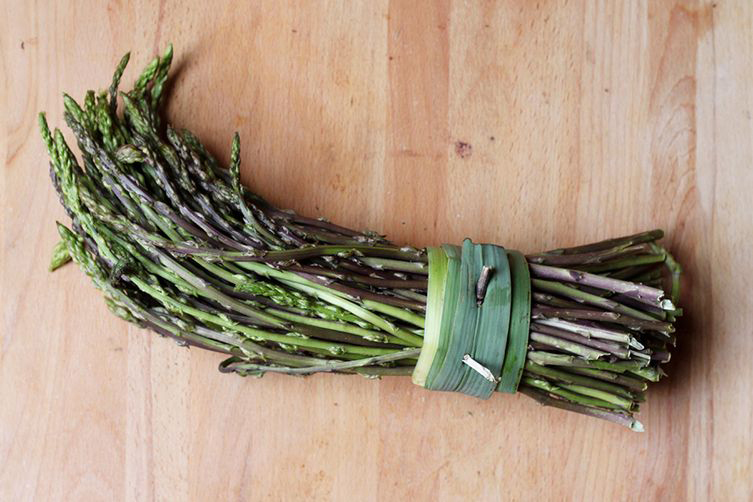 Place asparagus in a bowl, sprinkle a pinch of salt on top and add oil and vinegar. I used pumpkin seed oil and balsamic vinegar, but you can also substitute with olive oil and regular vinegar of your choice. Add sliced eggs and a bit of ground black pepper and mix well. Serve with a bit of bread. 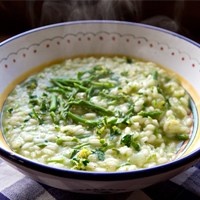 In a saucepan bring the stock to a boil and set aside, in close range of where you will be cooking the risotto. In a large, heavy bottomed pot melt 2 tablespoons of butter and add the diced onion with a pinch of salt. Cook on low until onion is completely translucent. Add the rice and coat with the onion and butter. Cook stirring frequently until rice is translucent. Add the lemon zest to the rice and cook for 30 seconds. Then add the white wine and turn up the heat to medium. Cook stirring often until all the white wine is absorbed. Add 1 cup of stock and a pinch of salt and cook until absorbed. Continue this process, stirring occasionally to make sure rice doesn’t stick. After ten minutes add the asparagus. Continue cooking the rice with stock until the rice is tender but still has a “bite”. You will have to stir more frequently towards the end to prevent sticking. When the rice is done, turn off the heat; add the lemon juice, a tablespoon of butter and the cheese. Stir vigorously to develop the creaminess. Taste for salt and add a splash more broth if needed. Place the chopped asparagus, potato and onion in a large saucepan and cover with the fish stock. Bring to the boil and cook for 10-15 minutes and add the milk. Place in a food processor and blend to a fine puree. Pass through a fine sieve; add the natural yogurt and season to taste. Calories 40 K cal. Calories from Fat 5.49 K cal. Calories 39 K cal. Calories from Fat 1.08 K cal.